We the parish family of Our Lady of Nazareth, are united by our commitment of service to others as living witnesses of the life, death and resurrection of Christ as taught by the Scriptures and His example. Develop authentic and meaningful liturgical celebrations to praise God and intensify our faith. Advance the physical, social and emotional well-being of the parish family and the human community by caring for the needs of the aged, poor, lonely, racially exploited, socially oppressed, helpless and suffering people. Contribute ample social activities so that we might develop as a parish family. Provide continuous religious education and formation for all parish members. Provide adequate physical surroundings, financial resources, and management to implement this covenant. When the City of Roanoke was only thirty years old, the Bishop of Richmond sent Father James Gilsenan to serve as Assistant at St. Andrew's and to begin a new parish in the southwest part of the city. Fr. Gilsenan was born in 1877 in Lurgan, County Cavan, Ireland, the son of James Gilsenan and Mary Bradley Gilsenan. He was ordained in 1904. The Catholic population of Roanoke was growing. Father Gilsenan purchased a beautiful property on Campbell Avenue. It included a magnificent brick building which became a convent for the Sisters of Charity of Nazareth, and also a two-story frame building which served as a school, staffed by the sisters. The school opened with eight grades, and added a grade each year until there was a complete high school department. 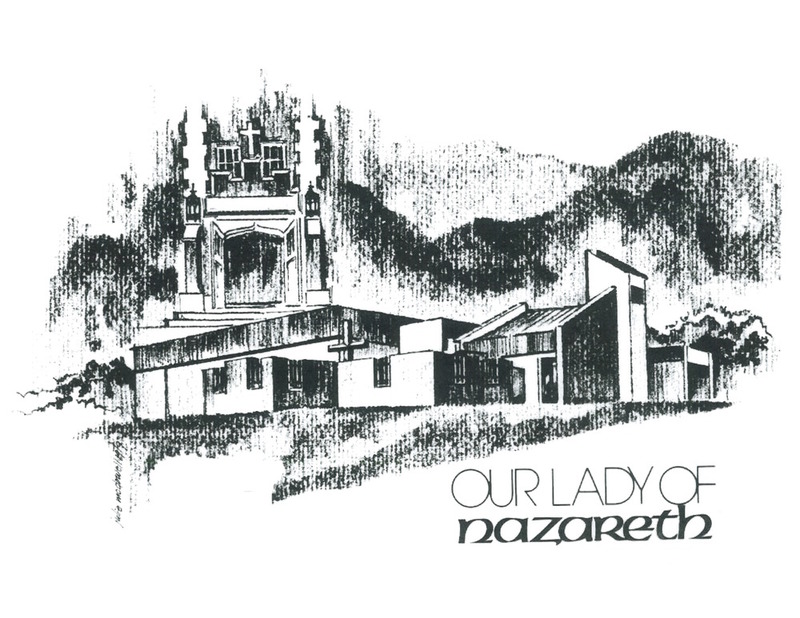 During the next fifty-six years, Nazareth School enrolled over 11,000 students. The sisters' chapel was the focus of religious life until 1918. At that time, the lumber salvaged from the razing of the little wooden school at the foot of St. Andrew's hill was used to construct a hall on the Campbell Avenue property. On the Sunday preceding Christmas, 1918, public Mass was celebrated there for the first time. This building is the present St. Francis House. Bishop Dennis J. O'Connell visited the hall on February 16, 1919, and announced the name of the new parish: Our Lady of Nazareth. At that time there was no other church by that name in the United States. Within six years, the cornerstone was laid for a new building, which was completed in 1926. When Father Gilsenan dedicated the church, his major goals were realized, but there were many years of debt and struggle ahead. During these years, Father Gilsenan made an indelible mark on the community, winning the affection not only of the parishioners, but the respect of the civic community for his participation in the life of the city and for his work with youth. Father Gilsenan was named a Monsignor in 1940. Msgr. Gilsenan died on September 12, 1953. His requiem was sung at Nazareth and he is buried in St. Andrew's Cemetery. Father Robert F. Beattie was the second pastor of Nazareth. He made extensive improvements to the property and, looking toward the future, purchased the first land for a new church. The last mass at the old church was celebrated on July 9th, 1978 and the new church on Route 419 was dedicated by Bishop Sullivan that same afternoon. It was with the help of a legacy from Miss Anita Obermeyer in the amount of $450,000 that the present facility on Electric Road (Route 419) was built. On June 25th, 1989 the Christian Life Center was dedicated in memory of Miss Anna Louise Haley (1910 - 1988). Nazareth has undergone many changes over the years, reflecting change in the Church and the world. Old organizations have given way to new as we have sought to express our faith and respond to the needs of our time. Parishioner involvement has been a hallmark of Nazareth throughout our history.